In a video uploaded on the Facebook page by News.com.au, one can see a gigantic bear riding a shotgun and even waving at the fellow commuters. Though much is not mentioned, it is clear that it took place in Russia. The video has more than 1,500 reactions and around 450 shares at the time of writing. Internet is a funny place, and there is no end to the absurd things one can find there. And truth be told, people on social media love animal videos, and Internet provides you plenty of them. Though most of them are cute and tug at our heartstrings, have you seen a enthusiastic bear riding on a motor-bike and even better waving at you? Well, say no more! 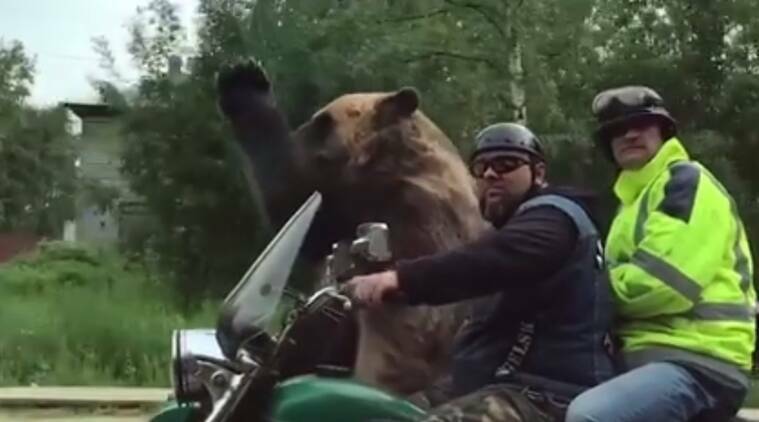 In a video uploaded on the Facebook page by News.com.au, one can see a man riding a motorcycle with an enormous brown bear in the sidecar. The animal even waves at the fellow commuters. Though much is not mentioned, it is clear that it took place in Russia. People are loving the video and it has more than 1,500 reactions and around 450 shares at the time of writing.